With more than 16,000 kilometers of coastline, more than 6,000 islands and islets, and a well-established tourism industry, Greece presents a prime investment opportunity in the Tourism sector. The country is one of the top global tourist destinations for sun and beach holidays, and also provides attractive propositions for year-round themed holidays. The competitive advantages of Greece, such as rich cultural heritage, natural beauty and geographical variety, have been attracting significant tourism investments in recent years, thus further strengthening Greece’s image as an ideal destination both for holidays and tourism-related investments. the development of key, new markets such as Russia, Israel, Turkey and China. The tourist industry is currently undergoing a major strategic improvement initiative, focusing on the expansion of the tourist period, the attraction of higher-value tourist segments, the increase of average daily spending and the opening of new tourist markets. The upgrading of the tourist product is supported by a number of initiatives by the Greek state, the Greek National Tourism Organization, the relevant business associations, and the regional authorities and municipalities, and is considered to be a strategic avenue for growth in the Greek economy. As part of this new strategy, private investments both in traditional tourist areas such as the Aegean Islands, the Ionian Islands and Crete, and also in newly developed destinations, such as the Peloponnese, are welcome and actively supported. A very promising investment opportunity combining existing infrastructure with new market development is the upgrading of local hotels situated in prime locations to internationally branded facilities. Several international investors have already taken advantage of such opportunities, recognizing the great opportunity in this high-value tourist product. 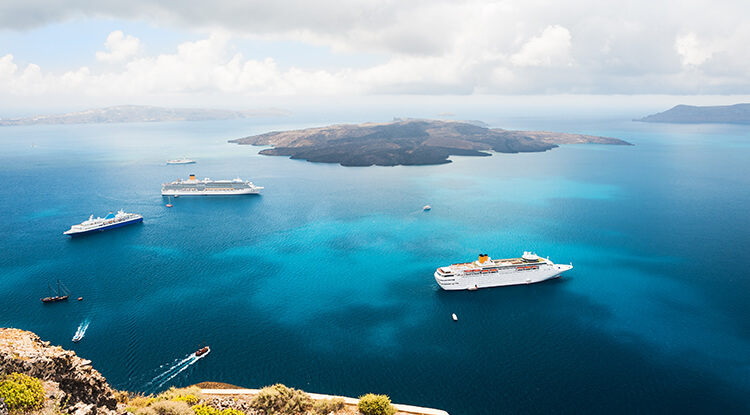 Greece is experiencing a boom in cruise numbers and visitors, following the recent regulatory changes that the country implemented in order to lift cabotage rules. This has liberalized the cruise market allowing non-EU flagged cruise ships to embark passengers from Greek ports, and combined with the infrastructure improvements currently planned in major Greek ports is expected to significantly improve the number of cruiseships using Greece either as a home port or as a destination. The main competitive advantages of the country include a great coastline, the large number of available ports –most of them close to world renowned attractions -, the small distances between destinations, and the country’s location - at the center of the Eastern Mediterranean Sea, one of the world's most visited regions. City break tourism consists of three to four-day trips to cities around the world, that offer a cimbination of cultural attractions and an active city life. It is a year-round source of tourist revenue, and has been a great growth driver for cities across Europe and Asia. Both Athens and Thessaloniki combine exactly the characteristics required for a significant presence in city break tourism – a strong cultural history, an active city life, an increasing network of direct flights to major cities, and great weather for city walks and short excursions to nearby places such as the islands of Spetses and Hydra or archaeological sites such as Vergina. With the appropriate investment in hotel infrastructure, facilities, and tourist services, Athens and Thessaloniki can significantly improve their attractiveness and competitiveness as international city break destinations, both for Western Europeans and also for emerging markets such as Russia, Turkey and Israel. Both the Ministry of Tourism and the municipalities of the two cities have voiced their strong support for investments and ventures that would improve this positioning and make the cities more attractive for city break tourism. Greece is one of the richest countries in Europe in terms of cultural and religious monuments and historical significance. Greece has a total of 18 UNESCO “World Heritage” sites which place it in the top 10 of countries internationally, and a number of museums, smaller sites and monuments and places of historical or religious significance. Once again, the Ministry of Tourism has declared its intention to significantly upgrade the cultural treasures of Greece in order to enrich its tourist product offering, and is open to discussing any potential investment opportunities that support this strategy. Medical tourism has been a source of growth for several countries or regions, driven by the desire of people to combine high-quality, lower-cost medical services with a hospitable tourist environment. With its abundance of skilled medical personnel, its proximity to major markets such as Europe and the Middle East and its excellent weather and environmental conditions, Greece can be a significant player in several areas of medical tourism. Investments in the development of specialized medical centers, elderly care facilities or long-term rehabilitation and wellbeing retreats can leverage the high number of available doctors and medical staff and generate high returns for investors. Such investments are further supported by the existence of significant overcapacity in medical facilities which would be available for purchase at reasonable values, and the adapted regulatory framework, allowing foreign investors to more easily enter the medical market in Greece. The meetings and incentives tourism market is significant both for its own value added and for providing an excellent lead-in to other forms of tourism, introducing a large number of delegates and conference-goers to new destinations which they may afterwards prefer for their summer holidays or city break. Until the recent past, Greece lacked infrastructure development related to conference centers and meeting facilities that are readily available for hosting large scale, globally attractive conferences. Since the 2004 Olympics, the country has significantly improved its related infrastructure and currently offers a number of meeting facilities across its main cities and destinations, ranging from large venues and theaters to smaller hotels and conference centers. Given the strong competitive advantages of Greece for MICE tourism and the desire of several Greek cities to develop this type of tourism, there are still significant opportunities for investors wishing to capitalize on the sector’s untapped potential and future growth. Such investments are strongly supported by the Investment Incentives Law, and when combined with the country’s impressive hotel infrastructure and excellent climate, can position Greece as one of the premier meeting and incentive destinations in the European continent by attracting a significant amount of conferences from large international companies and associations, thus yielding lucrative returns on capital invested. The Legislation for Integrated Tourism Resorts and Holiday Housing introduced new opportunities in integrated tourism resorts. The legislation (4002/2011) provides the right environment for significant and recurring capital inflows from foreign direct investment and strengthens the activities of the tourism industry along with the tourism-related domestic production sectors. The Law defines for the first time Integrated Tourism Resorts and provides the legal framework for investments in this subsector. Furnished tourist residences included in integrated tourism resorts may set individual properties divided horizontally and vertically, according to the provisions of the law and these may be leased or transferred to third parties. This Law acts in combination with the Law for Residence permits (4146/2013), which offers to non EU citizens the right to get a residence permit, if they own a €250,000 real estate asset, or a ten-year time-sharing contract under Law 1652/1986, or a 10-year lease of hotel accommodations or furnished tourist accommodation (houses) in tourist accommodation complexes according to Article 8, par. 2 of Law 4002/2011 (A’ 180).